Take a tour of our school and you’ll immediately see the impact of the Annual Fund. From the introduction of our Robotics Club and VEX programming to Wi-Fi enabled classrooms and K-5 Lego STEM programs—your support has made a difference in empowering the next generation of learners. To ensure current All Saints students are equipped with skills required for careers of the future, our 2018-19 Annual Fund will continue its STEM focus (science, technology, engineering and math). 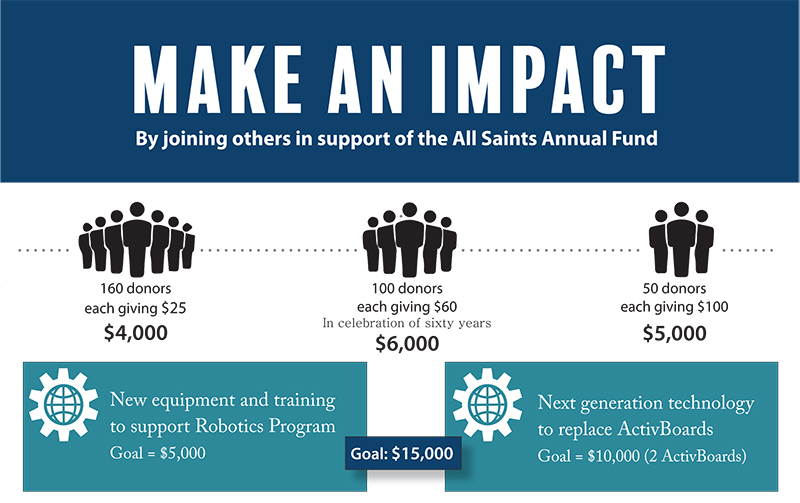 You gift to All Saints will make a direct and immediate impact! A gift to the Annual Fund symbolizes your belief in our mission. Participation is critical. High levels of participation will demonstrate our community’s shared commitment to our students. To share your gifts of prayer, involvement, and financial participation, please print our 2018-19 Annual Fund Brochure or Make an Online Donation below. *Although recognition levels are specific to financial giving, each gift of prayer, involvement and financial participation is cherished by our community. For your convenience, you can support our Annual Fund by making a financial gift online. If you would also like to add a gift of prayer or involvement, you will have an opportunity to do so after submitting your payment. If your employer participates in the United Way, you can direct a set amount of your United Way gift to All Saints Catholic School. 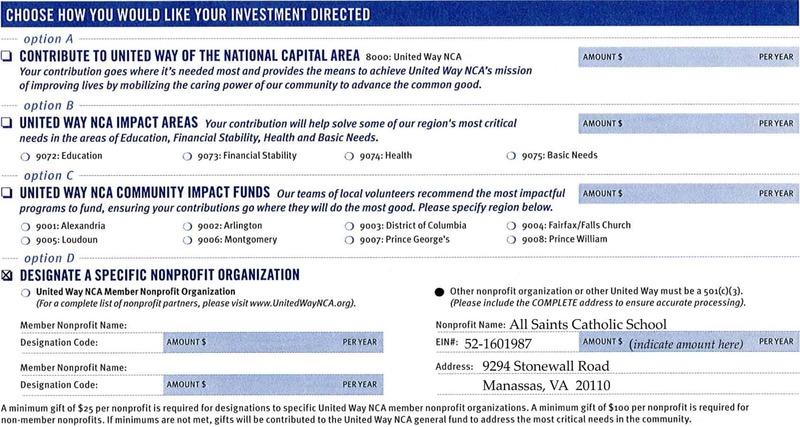 It’s as easy as designating All Saints as a recipient on your United Way contribution form. See sample United Way form. Please note that a minimum gift of $100 per nonprofit is required when making a contribution to a non-member nonprofit. If you have any questions, please contact Janis DeVore, Director of Marketing & Development, at jdevore@allsaintsva.org. please contact us at (703) 368-4400. Thank you for supporting our mission!